Thanksgiving is a time for family and fun and with these Thanksgiving freebies, you'll be able to save so much money that you can spend your time thinking about what really matters this holiday season. Look below to find Thanksgiving freebies including free cards, decorations, coloring pages, computer wallpaper, worksheets, and games. Whether it's a month until Thanksgiving or the day of, you can make your home look fantastic and make sure your friends and family have a great day with all these freebies that will save you both time and money. After your Thanksgiving fun is over, come back and check out all my Christmas freebies so you can save both time and money this holiday season. 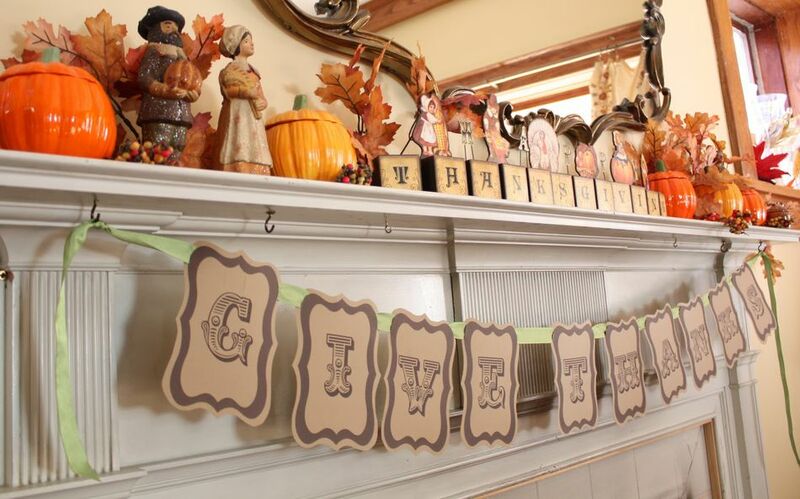 These free Thanksgiving decorations can be printed from your computer and then used to decorate your whole house for Thanksgiving. Your Thanksgiving table is where you can really shine with your decorations. Here you'll find free, printable menus, placemats, napkin rings, dessert tags, favor boxes, utensil holders, and more. You can also easily add some free Thanksgiving decorations with these free printable centerpieces that will look great on your table. To add more decoration and some planning practicality, you'll want to check out all these different styles of free, printable Thanksgiving table place cards that you can personalize for your guests. Decorate your home office or any other room in your house with these free Thanksgiving computer wallpapers. You can even add them to your laptop, tablet, or phone and enjoy them on the go. You can also choose a free autumn wallpaper to add a splash of color and warmth to your computer screen. These free Thanksgiving coloring pages can be printed from your computer and then handed off to the kids. The kids will also love coloring these turkey coloring pages or or fall scene coloring pages and will have even more fun hanging them up around the house. These free Thanksgiving cards can be customized and then printed out from your home computer. You can then mail them out to friends or family whom you won't get to see this Thanksgiving. You can also choose to send a free Thanksgiving ecard if you are short on time or want to make your Thanksgiving a little greener this year. These Thanksgiving games are for kids and families include conversation starter games, turkey tag, Thanksgiving Pictionary, scavenger hunts, trivia, bingo, and more. Some of the games are great for kids to play while you're getting dinner ready and others are great way to have family time after dinner has wrapped up. Whether you're a teacher, homeschooler, or just a parent with your child's educational interests in mind, you'll want to check out this list of free Thanksgiving worksheets. These free worksheets are all Thanksgiving themed and include subjects in math, reading, and writing. You'll find free Thanksgiving math worksheets as well as free Thanksgiving word search puzzles. There are plenty of free Thanksgiving clip art images you can download of turkeys, pilgrims, Native Americans, Thanksgiving food, and pumpkins. You can also find a separate list of just free turkey clip art that's available. Since Black Friday is part of many people's after-Thanksgiving celebration, I wanted to share with you this list of Black Friday freebies. This will tell you where to stop when you're doing your shopping to load up on free stuff.